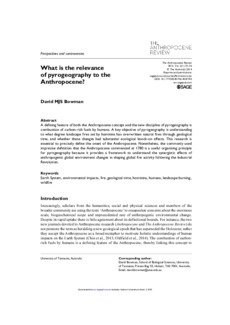 eCite - What is the relevance of pyrogeography to the Anthropocene? What is the relevance of pyrogeography to the Anthropocene? A defining feature of both the Anthropocene concept and the new discipline of pyrogeography is combustion of carbon-rich fuels by humans. A key objective of pyrogeography is understanding to what degree landscape fires set by hominins has overwritten natural fires through geological time, and whether these changes had substantial ecological knock-on effects. This research is essential to precisely define the onset of the Anthropocene. Nonetheless, the commonly used imprecise definition that the Anthropocene commenced at 1780 is a useful organising principle for pyrogeography because it provides a framework to understand the synergistic effects of anthropogenic global environment changes in shaping global fire activity following the Industrial Revolution.